Yashinka is young, only twenty-one years old, and wears his dark, coarse black hair like a 1960s-era Beatle; he never wears a hat, says he doesn’t like them, but does wear a headband to keep the hair out of his eyes. Across his chest dangling from a shoulder strap is a large digital camera with an oversized lens. Yashinka is a photographer for a Japanese magazine and is doing a story about the PCT for his publisher. His English is good, and the bubble of hikers he hikes with have taken a special liking to him. The town of Mount Shasta was not big; within a couple of hours I had walked all the city streets. I like to window-shop, you know, just browse the storefront windows, to see what was going on inside the establishment, to see what the owners were selling. I found a bookstore and spent a lot of time going up and down the aisles, sampling books on history, books on computers, and books about people – bookstores are my favorite places to hang out. There were hikers in town; most I didn’t recognize, but their clothes and beards, if they were men, gave their identity away. I saw one young man loaded down with a large pack searching the streets for something, and on top of his pack was a full-grown cat secured to the pack with a chest harness and leash. I loved it. The town of Mount Shasta is definitely unique and the best word to describe this uniqueness would be the word "mysticism." According to the locals, the town has a supernatural aura about it; it’s known, far and wide, as a place of spiritual light, a place where one can come for healing, for spiritual readings, for meditation and reflection. The town is a magnet for mystics, gurus, and sages, and judging from the number of placards and signs I saw hanging in the windows of homes and business establishments, healing by the use of crystals and other exotic gem stones is a primary activity for many people in town. 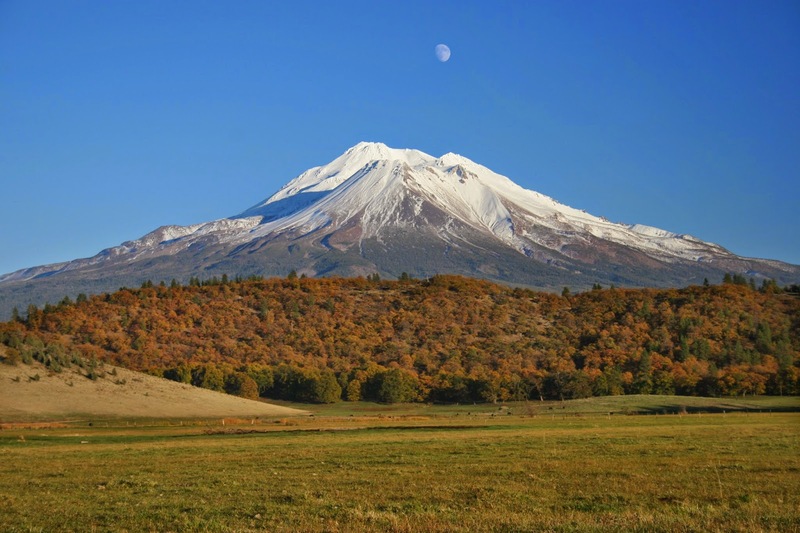 Mount Shasta is in the same league as Sedona, Arizona, and Bath, England, three towns renowned for their culture of mysticism. Perhaps the most popular example of Mount Shasta lore, and a legend involving the first claim by non-Native Americans for a spiritual connection with the mountain, concerns the mystical brotherhood believed to roam through jeweled corridors deep inside the mountain. According to Miesse, "In the mid-19th Century paleontologists coined the term "Lemuria" to describe a hypothetical continent, bridging the Indian Ocean, which would have explained the migration of lemurs from Madagascar to India. Lemuria was a continent which submerged and was no longer to be seen. By the late 19th Century occult theories had developed, mostly through the theosophists, that the people of this lost continent of Lemuria were highly advanced beings. The location of the folklore 'Lemuria' changed over time to include much of the Pacific Ocean. In the 1880s a Siskiyou County, California, resident named Frederick Spencer Oliver wrote A Dweller on Two Plants, or, the Dividing of the Way which described a secret city inside of Mount Shasta, and in passing mentioned Lemuria. Edgar Lucian Larkin, a writer and astronomer, wrote in 1913 an article in which he reviewed the Oliver book. In 1925 a writer by the name of Selvius wrote "Descendants of Lemuria: A Description of an Ancient Cult in America" which was published in the Mystic Triangle, Aug., 1925 and which was entirely about the mystic Lemurian village at Mount Shasta. Mount Shasta is a great place I would definitely come back to visit, but next time, it will be on my Honda Gold Wing motorcycle. Before heading back to my motel room, I made a visit to the major grocery store in town – Ray’s Food Place. In addition to purchasing snacks and chocolate pudding cups, I also bought a green salad, some tomatoes, and avocados. I don’t normally do green stuff, but I thought the leafy material would do my body some good. At the checkout stand, I ran into Cookie, who said she and Runs-with -Elk were camped at the campground just outside of town. Cookie’s one of those pleasant individuals that is always fun to visit with. I hadn’t seen her in several hundred miles. Mount Shasta, home of the mystical Lemurias, dominates the horizon for many, many miles.